Read the latest updates on Blanca's condition. 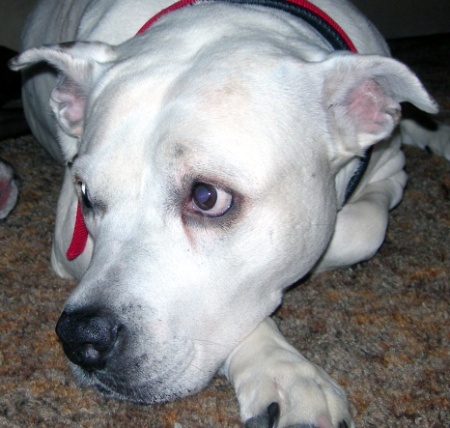 Blanca is the pit bull that inspired this website. It will be 11 years this November that I adopted her from the SPCA of Texas as a 4 1/2 month old puppy. At the time, I didn't know much about pit bulls. I was vaguely aware of the controversy surrounding them. But, I didn't care about that. I fell in love with her the moment I saw her. I'm not so sure it was the same for her. She was a bit aloof at first. But, over time I won her trust. And in addition to all the sweet, tender moments I have shared with her over the years, my life has taken a direction (pit bull advocacy) that I would not have known about had it not been for her. Aside from a problem with her back legs that was surgically corrected years ago, Blanca has been a healthy, happy girl all of her life until recently. It started about 3 months ago. We came in from outside and I noticed that Blanca was pawing at her eye. When the ointment I got from our local vet didn't help, my husband and I took her to another vet for a second opinion. We were told that Blanca had an ulcer on her cornea. And, the vet recommended a different anti-biotic cocktail and gave us an e-collar to prevent her from scratching her eye further. Administering all these eye medications was a pretty traumatic affair. Blanca hated it. And since it involved three different medications given four times a day, she had a lavage port surgically implanted to ensure all the medicine was getting into her eye. During this period, she also had the area around the ulcer debrided and another procedure that involved making tiny cuts on her cornea to give the new healthy tissue a better chance of taking hold. Oct. 2010 Blanca's Eye Weeps Constantly. She's worn an e-collar for 3 months. Rock solid in temperament, through all this she has been a trooper. After awhile she realized we were trying to help her and became more relaxed about the treatments and letting the vet examine her on a weekly basis. We had such high hopes for this form of treatment. But after a few weeks trial, it hadn't produced the necessary improvement. Our vet started consulting a specialist--a veterinary opthalmologist. (Who knew there was such a profession?) He suggested one last two-week round of home treatments with a different medication that is used on horses called Adequan. Again we were hopeful. Again the results were insufficient. I took Blanca to see the opthalmologist. He is based in Memphis, but comes to the hinter-lands of Arkansas once a month. He says Blanca has an indolent corneal ulcer--meaning an ulcer that won't heal by normal means. He can fix her eye with surgery. He says we've exhausted all other treatment options at this point. But, that with surgery, her eye will heal quickly and she will be as good as new or close to it. That's the good news. Of concern, is that she needs the surgery ASAP. It's called Lamellar Keratectomy and it carries a price tag of approximately $1250.00. The longer we wait, the greater the risk that the damage will spread to the inner parts of her eye. If that happens, she will lose vision in that eye. In the extreme, she could lose her eye. My husband and I are still trying to recover from what we've spent up to now for Blanca's treatment. The opthalmologist doesn't do payment plans or accept Care Credit. So far, we've been turned down by the foundations we've applied to for assistance--either because we are not on public assistance ourselves or because Blanca's condition is not life threatening. So, I've set up this page to give anyone who wants to help Blanca by donating to her surgery fund the means to do so. Just click the "ChipIn" button to be taken to a page where you can make a donation. Update: Our fund raising event ended November 16, 2010. With the money that's been generously donated here and the money we've been able to set aside from our paychecks, we now have enough to cover Blanca's surgery. Her surgery is scheduled for November 30th. The timing of all this is a true miracle since the opthalmalogist only comes to Arkansas once per month and no surgery dates were scheduled for December due to the holidays. Thank you one and all who helped make this possible. 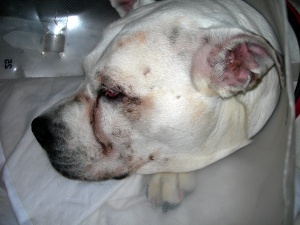 I will be updating this page after November 30th to let everyone know how Blanca is doing "post-op". In the meantime, have a happy Thanksgiving! Update: 12/05/10 I am happy to report that Blanca's surgery went well. She no longer wears the e-collar (Yay!) and seems more relaxed and comfortable than I have seen her in a long time. She isn't pawing at her eye at all. And, the bronzing stain underneath her eye is beginning to fade. She will be seen by the vet in about 10 days. The vet will stain her eye to see whether the cornea is healing as it should. Please keep us in your thoughts and prayers. And, I'll keep you abreast of further updates as they happen. Thanks again everyone! Update: 12/12/10 More good news! Blanca had her 10 day post op visit with our vet. And, her eye is progressing as it should. Frankly, I was a bit worried before she went in because her eye looks kinda funky right now. The iris and pupil are covered by a cloudy film tinged with red. But, the vet says the reddish color is produced by the new blood vessels that are forming and the cloudiness will eventually reduce to the size of a pinpoint. Blanca goes back to see the specialist for what will probably be her final checkup in January. Meanwhile, merry Christmas and happy holidays to each and every one of you.